Receiving a diagnosis of Macular Degeneration can be a frightening event. Many people have told me they feel anxious, worried and alone. 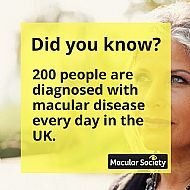 This is where the wonderful Macular Society can play a role. Not only do they help fund more research into a cure, but they can provide invaluable support and information for the newly diagnosed. Becoming a member of the Macular Society give you access to their quarterly magazine full of news, knowledge and tips. They can also put you in touch with local support groups where you can meet people who truly understand what you're going through. And if you are unable to leave your home they offer a Telephone Befriending Service putting you in touch with people with similar interests or experiences.